Overview: The Silk Road China travel tour itinerary covers top tourist attracions in Southern Xinjiang such as Urumqi Heavenly Lake, Kashgar Sunday Bazaar, Id Kah Mosque,Abakh Khoja Tomb, Karakul Lake, Stone City in Hotan, Aksu etc.. Welcome to Xinjiang! Upon your arrival in Urumqi before afternoon, your local guide will meet you at the airport and transfter you to visit the Terai Camp, Nanshan Grassland. Then you will be driven back to Urumqi to check in your hotel for overnight. As a natural world heritage, Tianshan Mountains is snow-capped all year around and has the beautiful mountain lake-the Heavenly Lake and Mt. Bogoda (5445m in altitude). Heavenly Lake, covering an area of about 5.9 square kilometers, has eight beautiful scenic spots in the lake scenic area; they are "A Ray of Stone Gate", "Dragon's Pool and Green Moon", "Magic Needle for Guarding the See", "Three Stones Bearing the Sky". 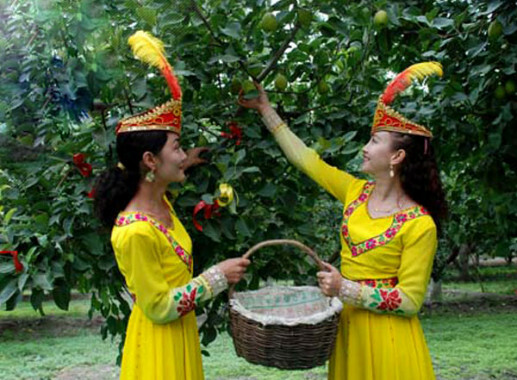 Drive to Korla, Korla is famous for pears, oil and local Mongols people, visit the Golden beach on the way. Along the desert road. we drive and arrive at Tianshan Grand Canyon after special local food as lunch. Tianshan Grand Canyon is featured by the mysterious canyon and caves in the deep moutains where scenery is fabulous and fantastic. Kizil Caves is regarded as one of China's greatest four caves. The caves were cut on the cliffs, the murals and frescos are well-preserved originally in a quiet and peaceful environment. This is a great day to drive ahead to Hotan along the second desert highway for the magnificent diversified poplar forests around Hotan river on the Taklamakan desert. Visit the Silk family, king of fig tree, Malikawat ruins, and local bazaar. Drive on the way to Kashgar, visit Yarkand and passby Yinjisar county famous for man-made knives. In the city east, Kashgar Grand Bazaar, Sunday Bazaar, Mal Bazaar or the livestock market on Sundays, daily Yengi Bazaar etc. show the glory of the largest international trade market or fair on ancient China Silk Road. Before 1992, Kashgar grand bazaar was only held on Sunday. So that foreiners called it Sunday Bazaar on travel guidebooks. In fact, the market is open everyday for people,but the highest busy tide still comes on Sunday. The Id Kah Mosque is located on the central square in Kashgar City, Xinjiang Uigur Autonomous Region. As the biggest mosque in China, it is a group of old Islamic constructions with strong ethnic style and religious features..
Drive 200km to Karakul Lake along China-Pakistan highway,enjoy the majestice Pamir plateau, encounter the local nomads called "Kirgiz". Admire the snow-capped mountain called "Muztagh Ata" And "Konger Mountain", walking around the Karakul lake (3800M), then continue driving to Taxkorgan. Visit the Stone City before sunrise, and golden valley, then drive back to Kashgar via Aoyitak glacier park. Take a morning flight to Urumqi, visit the Xinjiang Museum, the Red Hill and then visit the Erdaoqiao International Grand Bazaar. Xinjiang Museum is the main institution to collect and investigate the unearthed cultural relics and specimens in Xinjiang. There are more than 50 thousand pieces of various kinds of cultural relics stored in the museum, among them, the ancient mummies represented by ‘the Loulan Beauty', manuscripts in Chinese, Kharosthi, Qiuci, Yanji, Tibetan, Uigurian and other characters prevailed in ancient Westen Regions, the silk ,wool, cotton and hemp fabrics and folk rainment, etc., are unusual tidbits in the world. After breakfast, you will have a relax until a morning transfer to the airport for your flight to next destination.